The transplanter is undoubtedly the most representative technology of horticulture. Its implementation in the production cycle has provided this fundamental sector of italian agriculture with a considerably wider and broader perspective. Transplanting, as compared to sowing, can speed up harvesting, reduce the number of failed plantations, ensure greater regularity in planting distance on the row. Sowing, anyway, is still considered as unique for high-density cultivations, such as leafy salads typical of the IV range products (cut lettuce, arugula, lamb’s lettuce, etc. ), or particular products for which it is important to preserve the integrity of the tap root such as carrot or radish, or also where it is not possible to exploit the advantages of transplanting due, for example, to environmental reasons. 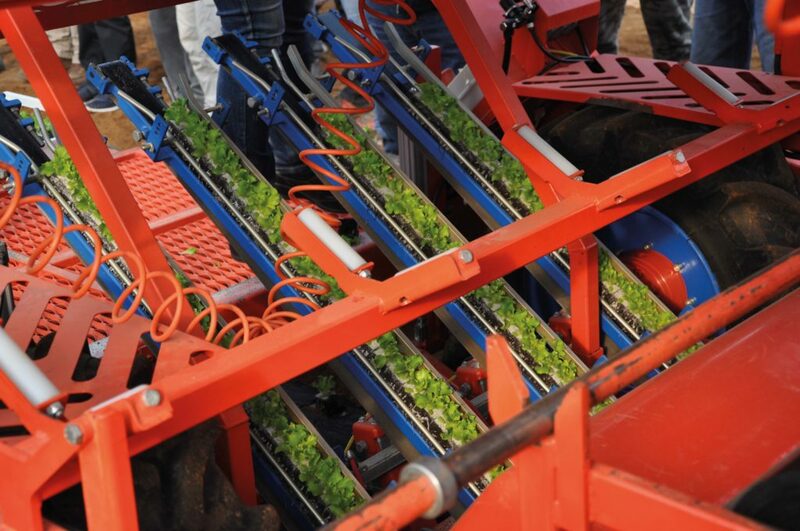 Semi-automatic or fully automated planters offer huge advantages against the totally manual transplanting method, still in use in few big Sicilian farms or in small horticulture firms that, due to their lack of areas suitable for specialized production, aim at variety of supply. The use of “simple” mechanized machinery allows already not only to eliminate hard work but also to achieve a standardized execution and a better agronomic quality. 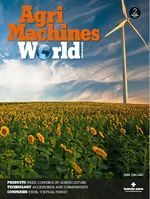 Moreover, mechanical transplanting reaches productivity levels up to 10 times higher than the manual one, and this important aspect is even more relevant as regards to timely execution of operations. In fact, the ideal periods to complete the transplant can be very short and so it is important to make the best use of the few suitable days, by working the largest possible surface area. With a manual transplanter, specific for seedlings grown in seedling cells, a man works from 1 to 1,4 seedlings per second (that is from 3.500 to 5.000 plants per hour). 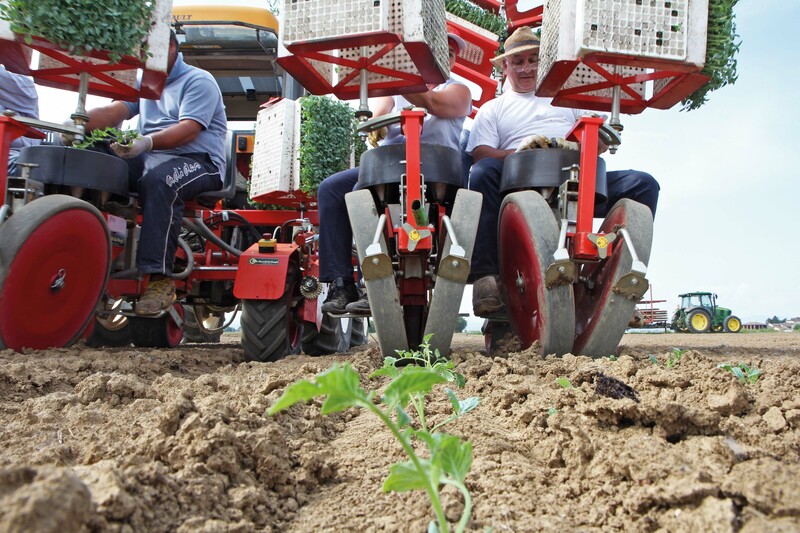 By using a semi-automatic transplanter values can double till 9.000 plants per hour. With this machinery, specific for seedlings grown in small cubes of pressed peat, the farmer can easily manage two transplanting rows (sometimes three) because, by using a trowel, he can introduce even 7-8 seedlings at a time. This means double productivity for each farm worker while for each row the productivity is comparable to that of a manual transplanter. In automatic transplanters, all specialized for the alveolus, the farm worker has only to check and to recharge the lines by placing the plant-holders: each element can transplant from 2 to 2,5 seedlings every second and a worker can manage till 4 (or 5) rows. The success of transplanters depends also on constructors’ ability (mostly Italians) to develop solutions adaptable to different agronomic technics, allowing, for example, the adoption of the twin-rows, quincunx pattern, mulching, drip irrigation, selected distribution of fertilizers or biocides, raised aboveground flower beds, conservative techniques of soil management. The twin-row technique is used for tomatoes and for other cultivations grown in spaced rows like celery, fennel, broccoli, endive, escarole, as sometimes it offers the possibility to rationalize the drip irrigation (one for two rows), some cultivation operation (treatments, weeding, etc. ), increase investment, simplify the harvesting. Twin-rows can be achieved by transplanting elements with a reduced overall width and arranged in staggered rows in order to avoid that operators of two near rows will hinder. Manual transplanters have been equipped with rotary distributors that feed two rows alternatively. With this solution it is important to have the possibility to change the distance between the two rows of the pair keeping the path of the seedling in a vertical position. 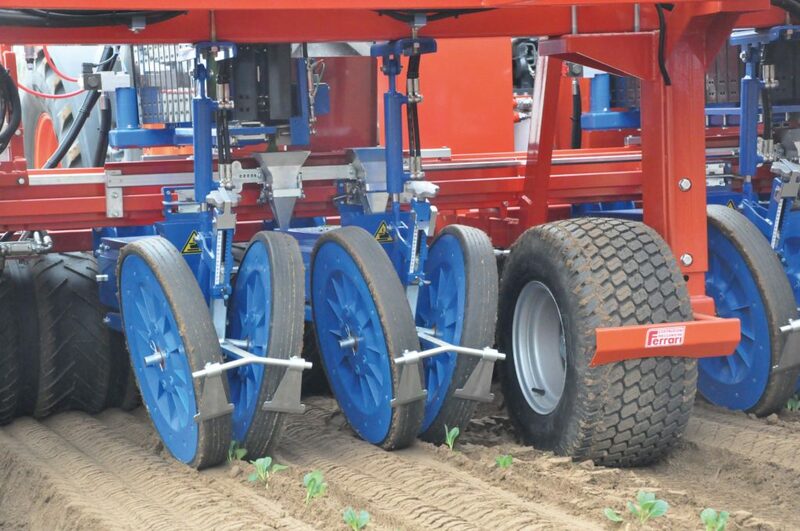 In twin-row cultivations or in reduced inter-row, it is convenient to adopt a quincunx scheme. When there is only one feeding line for the two rows, laying is alternate and produces a precise quincunx arrangement (quincunx is obliged). The quincunx arrangement is useful also in some cultivations with narrow inter-row space because it allows a better interception of solar radiation and a lower root competition. In these cases it is not easy to realize a quincunx arrangement as the transplanting rows are independent. Depending on the technological content of the transplanter, this aim can be achieved by acting on mechanical or electronic devices. The last ones, easier to manage, are usually present on semi-automatic and automatic machinery. of 6 or 7 cubes at a time. Technological content of transplanters must ensure to achieve a high agronomic standard whatever the category is, because only in this way, the potential advantages of this technology become concrete and tangible. That’s why the technological solutions offered by the quality manual transplanters are similar and sometimes equal to those of the automatic ones. Let’s examine the four technological solutions that most affect the quality of the work done with a manual transplanter. The first concerns the component of the machine with which the operator interacts, that in the most efficient equipment, consists of a rotary distributor with a vertical rotation axis and rotation speed proportional to feed speed. This device can replace or, in case of transplanting on mulching film, combine with the cups conveyor belt, a component with horizontal rotation axis. It is especially important with regard to ergonomics, since, acting as flywheel of the system, it reduces human assistance to the machine, that, on the contrary, is fully required in machines that have only the cups conveyor belt. The operator can insert the small seedlings in their places well in advance, without having to wait for the passage of every single cup. This allows to increase his productivity and most of all to maintain it all working day long. In the end the number of failed plantings (caused by bad insertion of seedlings) would decrease and the distance row would be more strictly respected. A second solution concerns the distributor rotation that, in some machinery, has an intermittent movement. The moment in which the seedling slot meets the tube that leads the seedling to the plowshare, the distributor stops for an instance before opening the bottom. In this way the seedling will not suffer any centrifugal force and will get straightly into the seed tube. The alveolus, in fact, can fall freely for a while because it has an aerodynamic shape: the substratum weight is balanced by the aerial part of the seedling that, acting like a sail, keeps the verticality during the fall. Once in the plowshare, in vertical position, it will be correctly inserted in the soil. In order to reduce the length of the drill tube, the seedling slots inside the rotating distributor can be deeper. With this modus operandi the seedlings will fall uniformly along the seed tube, and will reach the plowshare at a time. Same falling time means same distance between the seedlings. With the aim of placing the seedling in the furrow respecting the verticality of its growth axis, it is necessary that, at the moment of the detachment from the machine, the inertia produced by the feed, is duly balanced. In some machinery with plowshare, the aim has been achieved by inserting an ejector that acts with a direction opposite to the forward one. This ejector can also remove soil and peat (detached from the alveolus) from the plowshare, keeping a clearance space suited to receive the seedling. With the purpose of maintaining the correct transplanting depth, also in case of ground uneven, it is necessary to connect the transplanting element to the frame through a jointed parallelogram and the point of detachment of the seedling must be near the wheel that follows the ground profile. This device has to be equipped with an oscillation angle adequate to the environment and have the possibility to change the load (that is the weight) on the ground. At low speeds the weight can be reduced, transferring part of the load on the frame so as to make the system more sensitive, or, on the contrary, at higher speeds, especially with irregular ground, it will be possible to load it further in order to avoid that oscillations propagate and consequently alter the placing of other seedlings. The transplanting of cubes should be always made with specialized equipment, as it requires a treatment different from that of the seedling. In fact, the cube has to be laid on the ground since, only in this way, it is possible to ensure the correct positioning in the furrow and avoid its reversal. This is obtained through simple devices consisting of vertical conveyor belts provided with a supporting surface on which the cube is laid manually (manual transplanters), or more complex devices like the semi-automatic transplanters. Here, every row is equipped with an oblique belt that feeds the transplanting element placed near the ground and composed of two rotors, or of two belts or of a couple of synchronized grippers, all normally propelled by a pneumatic device. The cube, more expensive than the alveolus, is a method to produce transplanting seedlings reserved to lattuces and more in general to cultivations with a fragile root structure, with a short growing cycle, with an early spring transplantion. These cultivations and some types of lettuce in particular, have a vegetative habitus that tends to expand in width: the leaves of adjacent plants can easily intertwine complicating the transplanting operation. Due to this, double laying can be frequent and, in salad with head, they cause nonconformity: the heads with halved weight and malformed are not accepted by the market. The tendency to intertwine the leaves is particularly frequent in curly leaves variety and especially in overgrown plants. On the other hand this happens frequently as it is very difficult to synchronize seedling production (in glasshouses) with cultivations in fields that depends on varying weather conditions of Spring. The solution for this problem has been found in a double-belt device. When the belt length is at least 1,5 times the length of the leaves, this device ensures an effective separation between the seedlings. The machine productivity is slightly lower if compared with the two-rotors device, but transplanting quality is significantly better.